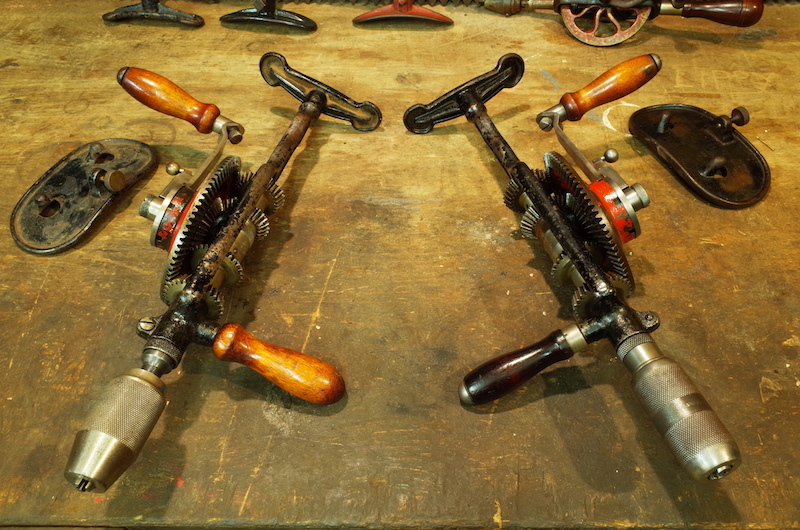 The Lords of breast drills, the only difference between these two is the Chuck. 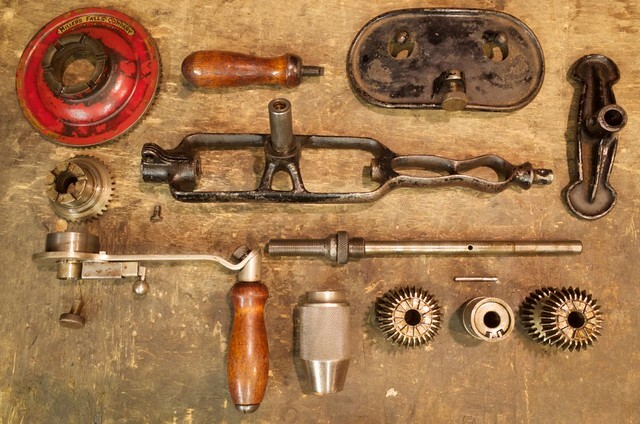 The Nos.87 & 97 are arguably the most sophisticated breast drills ever made. 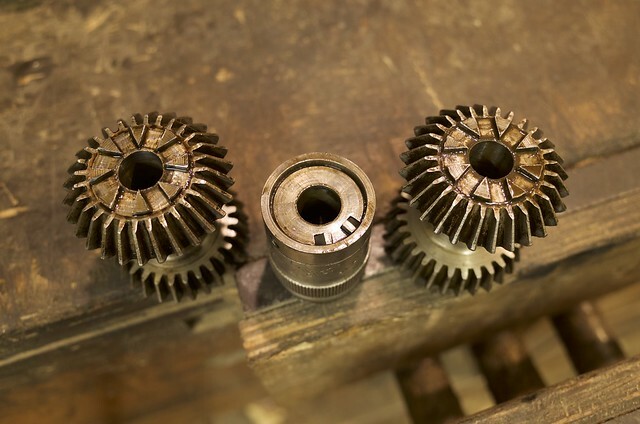 Possessing a two-speed unit changed via the spherical topped selector switch at the base of the crank, this is one of the easiest systems for changing gear on any breast drill. 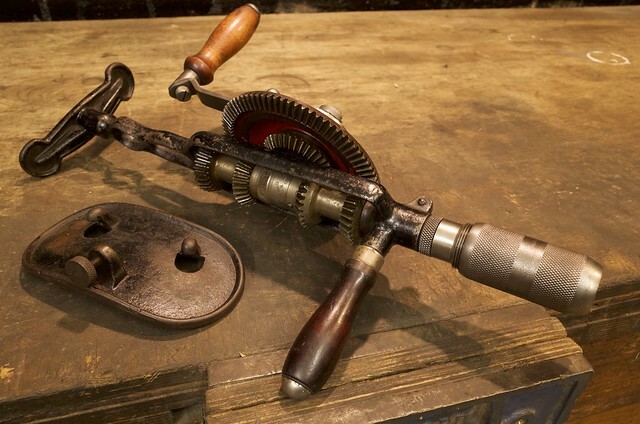 The drills also equipped with 5 ratchet modes that enabled the user to drill without complete rotation of the crank handle. – R.H. Onward – The drill will spin clockwise (from the point of view the your using the drill) no matter which way you crank. – L.H. 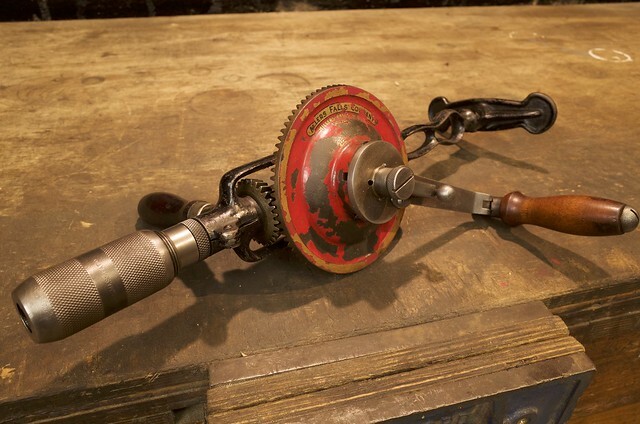 Onward – The drill will spin anti-clockwise (from the point of view the your using the drill) no matter which way you crank. 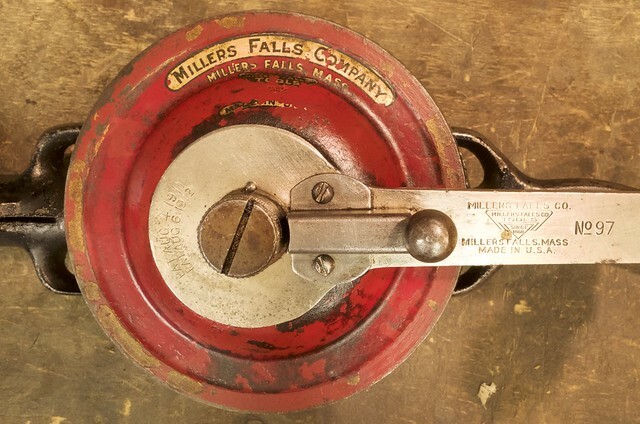 The Nos.87 & 97 were state of the art for hand powered drills during at the time they were made, with Millers Falls proudly referred to the tools and their ratchet system as a “continuous motion” drill. 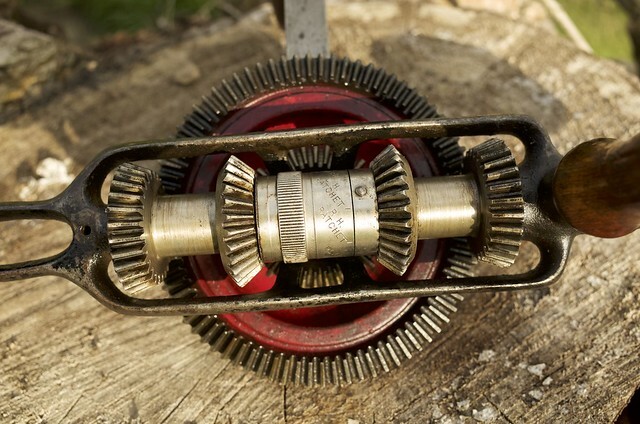 Today the ratchets are somewhat redundant, with the specialised tasks that they were designed to aid with (drilling in-between the spokes of a wheel on an old car) being a thing of the past for most people. They are mostly a fascinating point of interest rather than something your likely to need. 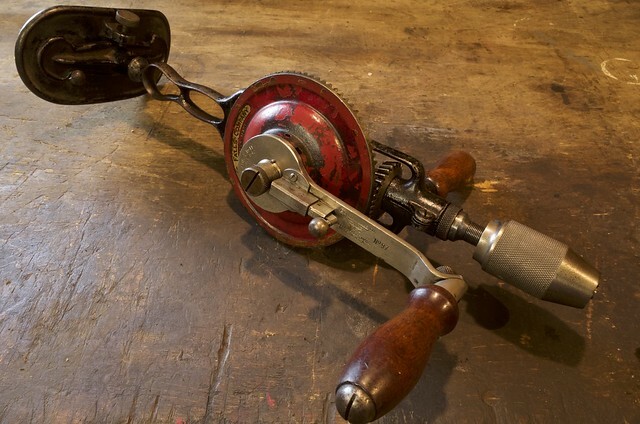 The crank handle can swivel 90 degrees to provide extra leverage and aid in tight spaces. The funny shape of the breast plate (not the larger auxiliary plate) is to allow more conformable hold on it with a hand, so the drill can be used at arms length (you need strong hands for that!). The build quality of these tools is what you would expect from a premium Millers Falls drill, superb. When using it as a conventional breat drill its easy to forget your driving round twice as many gears as with a normal gear drill (the No.97 has 6 to the normal 3), indeed the ease and smoothness of drilling outclasses many much simpler premium breast drills. One weakness of the Nos.87 & 97 is with all those parts they are one of the heaviest designs for breast drills out there, however thanks to good all round ergonomics it handles immense bulk well. Special Features: Ratchets, 2-Gears, Adjustable handles, Auxiliary Breast plate. 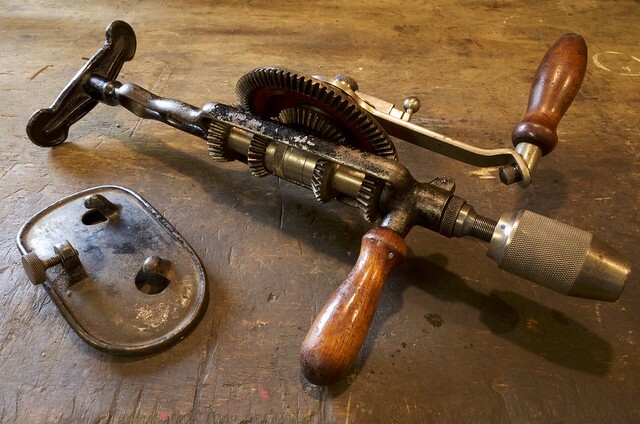 Notes: The original side handles have screw drivers for the screw that adjusts the positions of the breast plate, the No.87 pictured here has a replacement handle. 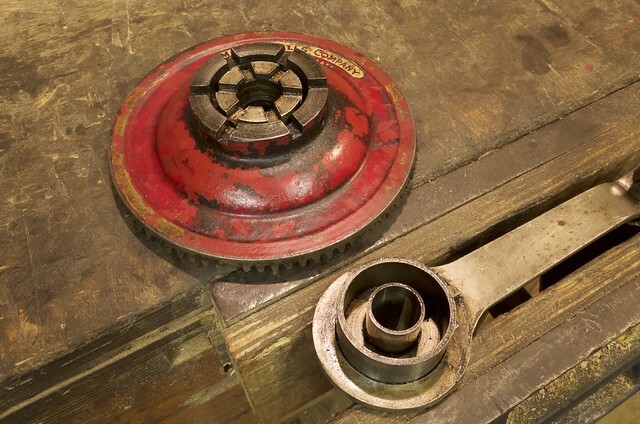 Previous post Edwin Hahn #9 restoration before and after.